Not to be confused with "strike aircraft", an alternative term for an ground-attack aircraft. 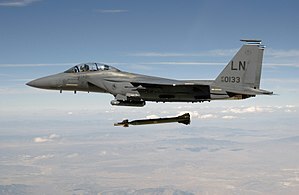 An F-15E Strike Eagle dropping a GBU-28 precision guided bomb. In current military parlance, a strike fighter is a multirole combat aircraft designed to operate primarily in the air-to-surface attack role while also incorporating certain performance characteristics of a fighter aircraft. As a category, it is distinct from fighter-bombers. Examples of contemporary American strike fighters are the McDonnell Douglas F-15E Strike Eagle, Boeing F/A-18E/F Super Hornet, and Lockheed Martin F-35 Lightning II. Since 1940s, the term "strike fighter" was occasionally used in the navies to refer to fighter aircraft capable of performing air-to-surface strikes, such as the Westland Wyvern and Blackburn Firebrand. It became normally used in the United States Navy at the end of 1970s, being the official description of the new McDonnell Douglas F/A-18 Hornet. In 1983, the U.S. Navy even renamed each existing Fighter Attack Squadron to Strike Fighter Squadron to emphasize the air-to-surface mission (as the "Fighter Attack" designation was confused with the "Fighter" flying pure air-to-air missions). This name quickly spread to non-maritime use. As the F-15E Strike Eagle came into service, originally called "dual role fighter", it instead quickly became known as "strike fighter". In 1995, the U.S. military's Joint Advanced Strike Technology program changed name to Joint Strike Fighter program. The project consequently resulted in the development of the F-35 Lightning II family of fifth generation multirole fighters to perform ground attack, reconnaissance, and air defense missions with stealth capability. ↑ "Aerospace Engineering, Volume 6." Institute of the Aerospace Sciences, 1947. ↑ The Aeroplane: Volume 75, 1948. ↑ "Inside story of the troubled F/A-18." Popular Science, Volume 223, Issue 4, October 1983. ISSN 0161-73702. Retrieved: 23 December 2011. Quote: ... can fly either as a fighter or an attack plane [...] In Navy parlance, it is a strike fighter. ↑ "The FY 1981 military programs." Bulletin of the Atomic Scientists, Volume 36, Issue 6, June 1980, p. 38. ISSN 0096-3402. Retrieved: 23 December 2011. ↑ Polmar 1997, p. 343. ↑ Defence Update (International), Issues 79-84, p. 43. ↑ "Joint Strike Fighter (JSF)." globalsecurity.org. Retrieved: 2 February 2011. Polmar, Norman. The Naval Institute Guide to the Ships and Aircraft of the U.S. Fleet. Annapolis, Maryland: Naval Institute Press, 1997. ISBN 978-1-59114-685-8.